A river tells its story through its geological history and the life that it supports. Much can be revealed to the discerning observer, as in the case of the Indravati river, which traverses the Bastar district of Chhattisgarh. The predominantly tribal population here, whose livelihood depends on this river, is a prime example of changing lifestyles and adaptive behaviour in the face of environmental challenges. The Kuruk of Chitrakot Bastar has a large population of Maria and Muria Gonds and other ethnicgroups with Kuruk fishermen, who represent a sub-class of the Gonds, occupying all the major fishing spots. 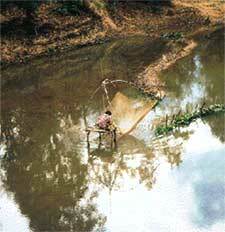 One of the most favourable fishing spots here is at Chitrakot, "the abode of the spotted deer." Here, the Indravati forms a magnificent horseshoe waterfall where hundreds of fish swimming upriver are halted and provide a rich year-round harvest. Further downstream, the river flows through a deep gorge. Although the sides of the gorge and the sandbars are thickly vegetated, much of the flora of the Indravati plain has receded in the wake of the steadily advancing wave of agriculture from the east. April-June is the peak of the fishing season when the water is muddy and the level is comparatively low. The river is rich in 43 species of fish, of which the carp family is the most abundant. Another sought-after species is the kokia (Channa punctatus), which is prized for its medicinal properties. Early in the morning, one can see the wooden dugout dongas of the Kuruk bob up and down on the sun-speckled waves of the great pool as their owners inspect fishing nets or bring in the catch. It is hard to imagine that in the days gone by, prisoners were thrown over the falls to the hungry crocodiles below. Today, this unfortunate reptile has been hunted almost to the point of extinction. Till about 50 years ago, the Kuruk used to barter fish for grain, but later on they had to take up agriculture due to the growing population and smaller catches. Today they grow rice, pulses, millets and a few vegetables. The family shares the harvest and the surplus is sold in the local weekly market. It is common practice here, as elsewhere in the district, to construct a series of embankments across the streams in order to retain water for the paddy fields. During the rainy season, small traps made out of reeds and cane are used to capture the small fish which get stranded in the fields. The villagers build bisar, wicker-work platforms supported by large boulders, sloped against the stream so that small fish like the kotri (Barbus stigma) are unable to pass and are thrown on to the platform. In the event of a poor harvest, it is amazing to see how readily the villagers can supplement their diet with wild edible plants, fish and small mammals that are still abundant in the gorge. Groups of women and children sing on their way to the gorge from where they collect the chiur grass (Cryptocoryne retrospiralis) that carpets the sandbars throughout the dry season. During the monsoon, the forest floor is covered with a variety of edible mushrooms. The forest also yields over 100 medicinal plants, of which the local communities have an intimate knowledge and in which they have great faith. Some wild plants have a multipurpose value, like siali (Bauhinia vahli). While the seeds of this robust climber are eaten, the leaves are ideal for making bowls, and the inner fibre of the stem is used for making rope. Summer is usually the season for the parad or annual ritual hunt, when large groups of villagers, armed with bows and arrows, comb the forest for any animal that might come their way. Formerly, this area was the home of the wild buffalo, tiger, sambar and other fauna. With the encroachment of agriculture, much of the game is now confined to the west, south and northwest of the district. However, the Maria around Chitrakot continue to hunt flying squirrels, birds and even field rats. The Kuruks do not represent a static society. This is evident in the rapid changes that have been taking place in this area due to influx of agricultural villagers to their region, new technologies , growth of towns and a marked reduction in the resource base available to them for foraging. Interviews with villagers from Chitrakot and Michanar, reveal that until forty years ago, conditions allowed greater social and economic mobility than that which prevails at present. During summer, small groups of villagers from Michanar and surrounding hamlets undertook fishing expeditions to several places along the Indravati. Increase in population and agricultual invasion forced the need to possess exclusive rights over certain fishing spots. Most people are now confined to the boundaries of their own villages and consequently there is a sharper distinction between members of various castes as social intercommunication has lost its flexibility. Today the rights of fishing at the Chitrakot pool belong mostly to the Kuruk residing on the southern side of the waterfall. On the northern bank, the population is sustained by agriculture as well as by fishing throughout the year. The latter, however, no longer constitutes as important a part of the diet as it used to. It is possible that with population pressure and the inability to supplement catches from the river by having ready access to plant foods, the Kuruk sought grain in exchange for fish. The restricted movement and denser population ultimately required the Kuruk and their neighbours to purchase whatever land was still available and to take up farming. Even today their land holdings generally do not exceed two or 1.21 hectares, some of which have poor drainage and have to be left fallow for a period of four to five years. Considering the biological affinity of various sections of the Gonds in Bastar and the former existence of a broader scope for cultural interchange as well as freedom of movement, it is possible that these groups have their roots in a population belonging to a cultural unit that was once bound by a stone tool using technology, but which was eventually segmented into various social and economic sub-units. All along the north bank of the Indravati river, from Bodhghat to Bhamragarsh, over a distance of 75 km, lie the Abujhmar hills, home of the Maria Gond. Poverty looms large over this area, so named because of its once impenetrable mountains, now held siege by the Naxalites who have prevented the introduction of tarred roads and electricity. Ironically, these self-proclaimed protectors of the Maria are largely responsible for their downtrodden state. Corrupt government officials have contributed their share of misery, pocketing most of the loans and benefits meant for the poor. Penda or shifting cultivation is no longer practised in the outer fringes of the marh, but is confined to the interior. For example, penda is the mainstay of the people (roughly 325) of Kutul, which lies in a small basin of hills, 40 km away from Narainpur in northwest Bastar. Even the highest hill is cultivated, regardless of the steep incline and rocky soil, although the summit and base are left undisturbed. Trees, though burnt, are not uprooted, thus allowing some regeneration to take place. February is the month when groups of 12-15 men husk the harvested millets (kutki) by stamping on them. Vegetables such as tomatoes, chillies, beans and sweet potato are harvested before the kutki. The husking is done on special mats and enclosed by a fence; surprisingly, fields are not separated by fences but by rows of til or roselle, or by laying a few logs along the edge of a plot. The sites of abandoned Maria villages can yield interesting information on land use a century ago or even earlier. Kunjang Kustanparre is one such settlement on the spur of a hill, a few kilometres away from Irakbhatty. All that remains of the settlement is a wall of boulders, now in ruins, and enclosing an area of about one acre. Within the enclosure were stone celts (once affixed to wooden handles and used as chopping implements), pieces of pottery and iron slag. Two groups of collapsed stone memorials beyond the enclosure suggest that two clans once lived here, although none of the older men from Irakbhatty could recall when this settlement was occupied. Whereas present-day Maria villages have bamboo wattle-work fences, an ancient one would have required a stronger wall as protection against wild animals or hostile groups. According to an elderly ironsmith (lohar), the only one for miles around, about 30 to 40 year ago, his father used to obtain iron ore from a nearby mountain. These days, of course, metal is procured from Narainpur or any other town. The pieces of slag found at Kunjang Kustanparre confirm that the tradition of mining local ore is a fairly ancient one. Existence of a small dam (naddi) across the local stream to provide water for the rice field and large tamarind trees sheltering the village provide interesting lessons in environmental conservation. It soon becomes apparent that despite the odds against them, the Maria have managed to survive due to their age old practices of resource management.